For this exhibition curated by Doren Mende we interpreted a text by Genesis-P-Orridge on Muzak. The design split and re-arranged the text in various information segments and arranged them in an A1 format. 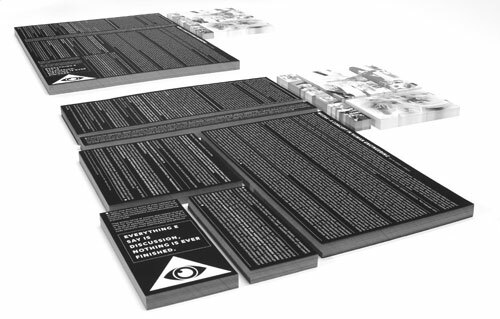 An image poster showing inverted frames from the film "DECODER" featuring FM Einheit and Christiane F accompanied the set. In the exhibition space paper stacks of the full-format design and a version which was cropped into its components were shown next to one another.